The Hockey Hut provides a number of different programs for individual players looking to take their play to the next level. We provide group skills classes where players receive instruction in a small group setting of 15 players or less. Providing players with the coaching and skills they need to take their hockey career to the next level. Private/semi private lessons provide players the individual attention they need to ensure improvement in specific skills and overall athleticism. Whatever the need is, Hockey Hut coaches develop a specific lesson plan for players to improve. Each players unique, Custom Program will include on ice training program along with a recommended strength training, flexibility, and agility program to help achieve maximum potential on the ice. *After registration, a representative from The Hockey Hut will contact you to set up your sessions. Purchase the “Flex Pass”! This gives a player access to any number of our group skills sessions. The skills sessions are skill specific so a player can choose a skating class, shooting class, stick handling class, offensive skills class, or defensemen’s class. These sessions are a great way to improve your skill base. Drop-in and unlimited access pass also available. Each class will contain elements of complete skill development, skating, stick handling, passing, shooting and scoring. These classes are for the advanced skaters and are taught by Pierre Leblond and/or Ron Kuhl. Fast paced skill development for fully committed players. Adult players looking to improve their skills can attend one of our adult skills sessions. This program is 4 sessions per month for $75/month. 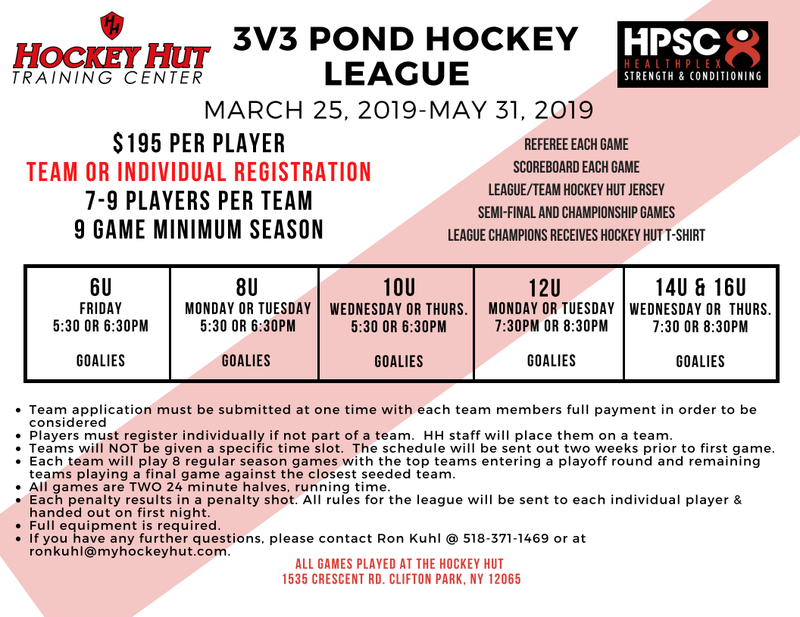 Tuesday Nights 9pm Starting April 9, 2019 at the Hockey Hut Training Center. $20 Drop in Fee applies. Our fast-paced, fun PHL runs during the months of March, April & May. The divisions are 8U, 10U, 12U, and 14U/16U. Each division is open to 8 full teams. Players may register as a full team or individually (staff will place on a team). Goalies are used in each division. Each player will play 9 regular season games and then playoffs will be played after. This league is about fun and creativity as a player and creates healthy competition each game. This program includes a Functional Movement Screening and 2 team training sessions with a HealthPlex Trainer! Registering more than one player? Online registration now available! Hockey Hut helps assess your current skills. The Hockey Hut will give each player a monthly evaluation regarding on-ice skills and off-ice improvements. This will be done through an Movement screening off ice and on-ice assessment. Each player will be given a monthly report card. Would you like to take your team to the next level? Team Training at the Hockey Hut will help your team to get the edge that will take them to the next level. No matter what skill or concept you are looking to have your team improve upon, the staff at the Hockey Hut has the experience to improve any and all areas of your team’s play. These are just some of the skills and concepts your team can improve with Team Training at the Hockey Hut. This program Includes FMS with HealthPlex Trainer and 4 Group Off-ice sessions. Have a day off from school? The Hockey Hut offers various day off from school clinics including various days such as Black Friday, Martin Luther King Jr, Spring Break, Columbus Day, & Veteran’s Day. These are just a few examples but always be checking the website for new clinics and upcoming sessions. The clinics are a great way to come spend your morning off from school! Mite Mania, Puck Control, Shooting School, Bantam Transition, and Battle Games! These camps are all at the Hockey hut between July and August. Camps include over three hours of on ice instruction including power-skating, puck control and shooting. All camps will involve instruction tailored to that week. Camps also include outdoor off-ice training and hockey skills. LTS is open to skater’s ages 4-12 years old. Join our LTS class for professional ice instruction for beginners. All skaters will be grouped according to skill level. Topics include bucket-pushing, swivels, inside & outside edges, stopping & starting and much more! LTP is a beginner level hockey class for players developing from our Learn to Skate program or who are looking to prepare for a 6U/8U season-long program. After spending 6 weeks in LTS and/or Hockey Tots, players will start their true journey into hockey. Skating is the emphasis but stick skills, pucks, and small games are all used to create a positive learning environment. If you have any questions about our programs or how to register, please send us a message.